Macro Talent Management in Emerging and Emergent Markets is the first book to focus specificially on country-level activities that are aimed at attracting, developing, mobilizing, and retaining top talent for economic success in emerging or emergent markets. The book serves as a guide that orients the reader toward activities that increase their country’s global competitiveness, attractiveness, and economic development through strategic talent management. This book brings together leading experts from around the world to address such issues as cross-border flows of talent, diaspora mobility, knowledge flows, global labour markets, and policies. The book is structured in three parts: Part I covers emerging markets, Part II emergent markets, and Part III pan-national themes such as migration and clusters. Bringing together research from the fields of human resource management, international business, economic geography, comparative international development, and political economy, this is a definitive, comprehensive treatment of the topic aimed at advanced students and practitioners. 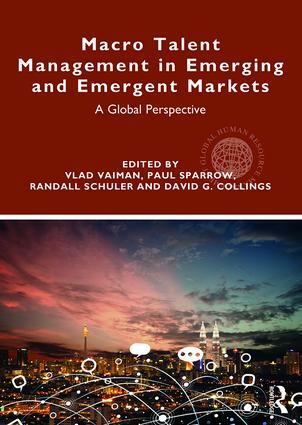 "An important and uniquely evidence-based guide to talent management in emerging markets, the unmatched credentials of the Editors and the impressive array of country experts make for an insightful, practical and intriguing set of perspectives on the vital talent management developments in these important countries." "As countries become ever more interdependent and as MNEs attempt to manage talent around the world, decision makers need synthesized, country-level information about government policies, institutions, and the processes that firms use to manage talent. This book is a great place to start." "The debate on talent management continues apace. Its exposition at the macro level serves as a powerful contextualization mechanism and underscores the importance of a ‘levels of analysis’ approach. Doing so in the specific case of emerging and emergent markets lays bare the capacities and the constraints that are operating in these dynamic territories as they pursue vigorous developmental trajectories against the backdrop of diverse endowments. " Vlad Vaiman, is Professor, School of Management, California Lutheran University, USA. Paul Sparrow, is Emeritus Professor of International Human Resource Management, Lancaster University, UK. Randall Schuler, is Professor, Rutgers University, USA, Visiting Scholar, University of Lucerne, Switzerland. David G. Collings, is Professor of Human Resource Management, Dublin City University, Ireland.